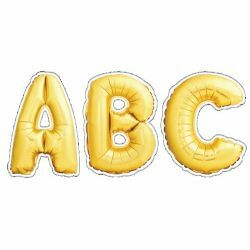 These Gold Mylar Balloon 6" Uppercase Designer Letters bring a modern flair to bulletin boards. The festive look of these punch-out letters is inspired by the popular gold mylar balloon decorations! This package comes with 106 uppercase paper letters approximately 6" high. The fun, modern look of these ready letters makes them versatile for use on any bulletin board or display in a school, an office, a college dorm, a senior living residence, a church, or a daycare center.